Basically supercharging means supplying high pressure air to the engine. When the high pressure air is supplied to the engine, the mass flow rate of fuel also increases and consequently it results in more power output. Hence the efficiency of the engine also increases. The amount of air supplied to the engine may be increased by increasing the speed of engine or by supplying high pressure air. The process of supplying high pressure air is known as Supercharging. And equipment used for supplying high pressure air is known as Supercharger. Note that Turbocharging is a particular case of supercharging in which compressor or high pressure air supplying equipment in driven by the exhaust gas driven turbine. This will be clearly understood while studying the methods of supercharging. (1) Supercharging is essentially required in order to increase the power of the given engine. (2) Supercharging is essential in order to increase the output power of the given engine, for given weight. It is to be noted that the weight factor is important in aeroplane engines. (3) We know that, as we go higher and higher, the air density decreases, so the engines get less air/oxygen and the output of the engines decreases and this decrease in power will be about 10% in one kilometre. In case of petrol (SI) engines supercharging is used only when the power output is the main consideration. (4) As the pressure of air increases, temperature of air at the inlet also increases. Thus when the high pressure and high temperature air is supplied to the engine, it decreases the ignition delay and this leads into pre-ignition and more detonation problems. During supercharging more amount of air is supplied and consequently more amount of fuel is supplied and this results in more fuel consumption. But power developed will be more than the naturally aspirated engines. (Note that the naturally aspirated engines are those engines which take air directly from the atmosphere and if the high pressure air are supplied to the engines, then they are known as supercharged engines). In order to summarise, supercharging of petrol (SI) engines is not generally used because of more fuel consumption, but is used when more power is to be developed. In case of petrol engines supercharging results in more specific fuel consumption. But whereas in case of diesel engines when high pressure, high temperature air is supplied to the engine, it results in better combustion. Also any existing combustion problem will be sorted out because of higher temperatures. Also it decreases ignition delay. Because of this improved combustion any low quality of diesel fuel can also be used in the supercharged engines. Fuel consumption of supercharged diesel engines is comparatively less than the naturally aspirated engines because of better combustion. Supercharged diesel engines are generally used because of their better combustion and improved mechanical efficiency. (1) In supercharged engines more amount of high pressure and high temperature air is supplied, which results in increased volumetric efficiency and more output power. (2) Because of more pressures, scavenging (i.e., removing the burnt gases out of the engine cylinder) will be improved. (3) By supercharging mechanical efficiency increases. (4) For petrol engines supercharging results in better mixing of air and fuel. Note that as more amount of air is supplied, more amount of fuel is also required to be supplied. Hence specific fuel consumption will be more when compared with naturally aspirated engines. (5) For Diesel engine by supercharging there is improvement in combustion and hence increase in mechanical efficiency. Supplying high pressure air to the engine is known as supercharging. And the supercharger is used to supercharge the engines. The supercharger may be driven directly by engine of output shaft through some gears or it is driven by the exhaust gas driven turbines called Turbocharger. (i) The compressor is driven by the engine output shaft through some gears. 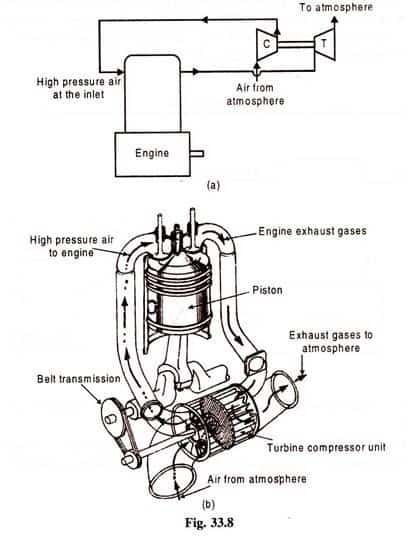 The compressor supplies high pressure air to the engine. Finally the gases are exhausted as shown. Note that a part of total output is used for driving the compressor and net output power increases because of supercharging.